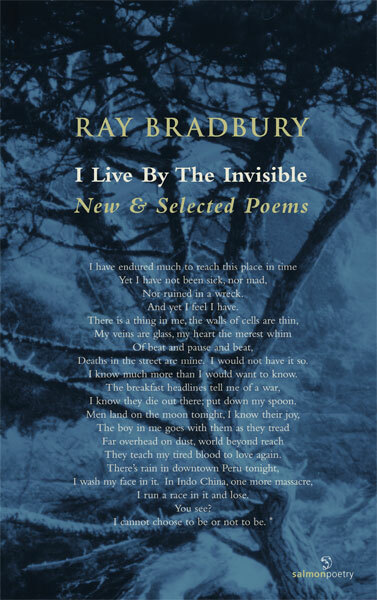 I Live by the Invisible: New & Selected Poems is Ray Bradbury's first poetry collection to be published outside the U.S. First published by Salmon in 2002, this 2008 edition is updated with additional poems. This volume is a gift to generations who have read and loved his remarkable work. A master of poetic nuance in his prose work, his poetry is at once immediate, subtle, revealing, political, philosophical and magical. The world of Ray Bradbury has always been a special place. Millions of people have shared in it; shared his longing; his insight; his visionary knowledge of things which humanity holds dear. These poems are haunting, telling, nostalgic, satirical, funny and wise. In his late 80s, Ray Bradbury is still sharing, and giving so much. Ray Bradbury, American novelist, short story writer, essayist, playwright, screenwriter and poet, was born August 22, 1920 in Waukegan, Illinois. He graduated from Los Angeles High School in 1938. Although his formal education ended there, he became a "student of life," selling newspapers on L.A. street corners from 1938 to 1942, spending his nights in the public library and his days at the typewriter to become a full-time writer in 1943, contributing numerous short stories to periodicals before publishing the collection, Dark Carnival, in 1947. His reputation as a visionary writer was established with The Martian Chronicles in 1950, which describes the first attempts of Earth men to colonize Mars, and the unintended consequences. Next came The Illustrated Man and then, in 1953, Fahrenheit 451, which many consider to be Bradbury's masterpiece, a scathing indictment of censorship set in a future world where the written word is forbidden. In an attempt to salvage their history and culture, a group of rebels memorize entire works of literature and philosophy as their books are burned by the totalitarian state. Other works include The October Country, Dandelion Wine, A Medicine for Melancholy, Something Wicked This Way Comes, I Sing the Body Electric!, Quicker Than the Eye, and Driving Blind. In all, Bradbury has published seventy-two books of short stories, poems, essays, and plays. His new novel, From the Dust Returned, was published by William Morrow at Halloween 2001. Morrow will release One More For the Road, a new collection of Bradbury stories, in April, 2002. Ray Bradbury's work has been included in three Best American Short Story collections. He has been awarded the O. Henry Memorial Award, the Benjamin Franklin Award, and the PEN Center USA West Lifetime Achievement Award. In November 2000, the National Book Foundation Medial for Distinguished Contribution to American Letters was conferred upon Mr. Bradbury at the National Book Awards Ceremony in New York City. Bradbury has been nominated for an Academy Award (for his animated film Icarus Montgolfier Wright), and has won an EMMY (for his teleplay of The Halloween Tree). He adapted sixty-five of his stories for television's Ray Bradbury Theater. Married since 1947, Mr. Bradbury and his late wife Maggie had four daughters together. Mr. Bradbury lives in Los Angeles. Nor ruined in a wreck. And yet I feel I have. Deaths in the street are mine. I would not have it so. I know much more than I would want to know. I know they die out there; put down my spoon. They teach my tired blood to love again. I run a race in it and lose. I cannot choose to be or not to be.